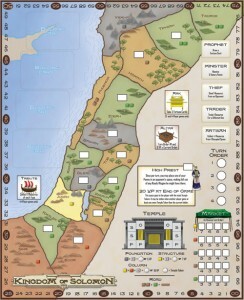 Kingdom of Solomon, from Minion Games and designer Philip duBarry, is a fun strategy board game with a biblical theme. Well, not laugh-out-loud, yell-at-your-friends fun. More like an interesting thinking-game. It’s what hobbyists might call a gamer’s-game, with alternative paths to victory that will take several plays to explore. I like it a lot. One of the things I like about Kingdom of Solomon is that while it’s definitely a strategy game with a lot going on, it’s also pretty easy to learn and very approachable. The rule book is just a few small pages. The mechanics are, for the most part, not difficult to learn, particularly if you’re a regular Euro-game player. And Fortune Cards add a little bit of luck—just enough to keep me on my toes. But while Kingdom of Solomon employs several standard Euro-game mechanics, it does so with a twist that’s very interesting. The game is basically a worker-placement game. It even has colored wood cubes to represent resources (gold, stone, food, copper, timber). What’s different is that in this game worker placement means placing pawns to claim territory spaces on the game map. Each space, then, provides one or more specific resources to the player who claimed it (e.g., Amalek yields food, Edom copper, and Gilead stone). Additionally, players have the opportunity to construct buildings in many of the territories, which reserves those spaces for their exclusive use on future turns, and to put down roads between territories, thus making multi-space regions for the more efficient collection of resources. That’s not all there is to the game, of course. Pawns can be placed to claim specific roles or actions, such as artisan, trader, minister, and prophet. Or pawns can be placed to claim the ark or altar (though these require all of a player’s remaining pawns at the time of placement). Resources can be bought and sold in the market. Also, the resources are primarily used to build the buildings, which in addition to reserving territories, grant victory points and create personal-use-only spaces for placing pawns. For example, if you build a library (it doesn’t matter which territory is goes in), you put the library card in front of you. Then on future turns you (and only you) can place a pawn there to get Fortune Cards. Regarding the biblical theme, I feel it worth mentioning that though it thoroughly pervades the game, I didn’t find it an especially religious game. It treats the material like any other historical setting. I believe the designer is Christian. I’m Jewish. I played the game with a group from my synagogue and no one had any difficulty with it. 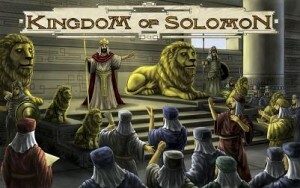 There are a few small things about Kingdom of Solomon that one could pick on. One is that the explanation of how regions are created and used is a little confusing, especially when you factor in the high priest (a special bonus earned by the player who has contributed the most to construction of the temple). Overall, though, it’s a good, not-too-difficult strategy game with an interesting theme and intriguing game play. If Minion Games hadn’t already given me a copy, I’d buy it. It’s a wise choice. Sounds interesting – but your review is missing a vital piece of information for me: how long is a typical game? If this plays in 90 minutes, it’s something I want. If it plays in 3 hours, I can’t use it. I tend to talk a lot and get interrupted, but I don’t see why it wouldn’t normally finish in the 60-90 minutes labeled on the box. It’s one of those games that takes a few turns to really get going, but then accelerates to the end.